When Kitty overhears her caretakers mentioning that they are out of food for her and that she’ll have to eat a delicious (to humans) alphabet of delightfully healthy choices from asparagus to zucchini, she decides at that moment that she will become a very, very, bad, bad, BAD kitty. And so the fun of Bad Kitty begins! To indicate her displeasure, she engages in an alphabet of naughty behaviors from “ate my homework” to “zeroing the zinnias.” Very silly, and very bad. Soon after her caregivers return home from the store with lots of good kitty treats, Kitty perks up (with zinnias still dangling from her mouth) to overhear yet another alphabetical list of all the yummy-to-fictional-kitties (decidedly not veg) things she’ll be getting, from “an assortment of anchovies” to “baked zebra ziti.” Finally, she decides to go back to being a good kitty and we are treated to one more hilarious alphabetical list of her kindly deeds from “apologizing to Grandma” to “lulling the baby to sleep” (zzzzzzzzz….). 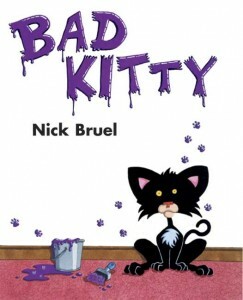 Just when I was feeling satisfied with the amount of chuckles author/illustrator Nick Bruel provided with this humorous tale, the ending provides one more. I won’t spoil it for you. The illustrations are a huge part of the magic of this book, with vivid depictions of each silly alphabetical mention. As noted above, Kitty’s delicious treats are not vegetarian or vegan but we found that most of them were so over the top that we laughed at the outrageousness of it all. We do not have vegetarian cats so our reality is that our cats are eating animal products. If you feel strongly about this issue, do check out the list of Kitty’s choices before reading to the children in your life. I was happy to discover this funny story and even more delighted to find out it is the first of a few Bad Kitty books. A fun read for silly kitty lovers ages 3 and up. Our cats are very carnivorous, so no doubt “zebra ziti” would sound wonderful to them. My ex’s daughter LOVES bad kitty! I came across this when I was looking for a chapter book series for her. On the way home from vegetarian summerfest, she read almost the whole new book I got her for the trip. Bad Kitty is a huge hit in our house. My oldest discovered it in kindergarten and went through the entire series at her school library. My youngest is now five and hadn’t shown any interest read aloud chapter books until we came across Bad Kitty. Now it’s all he’s interested in. Every night he wants to read or reread Bad Kitty. His favorite is Happy Birthday, Bad Kitty! And now my oldest, age 9, has rediscovered her interest in Bad Kitty and has started sneaking away with her younger brother’s books to reread them. Several times it’s mentioned that Bad Kitty was adopted at an animal shelter, which fits nicely into the ethos of vegbooks. I highly recommend this series to anyone with a 5-6 year old. Younger children will not likely get the jokes. Older children will still love the books but they are super easy to read. This series is especially great for reluctant readers.